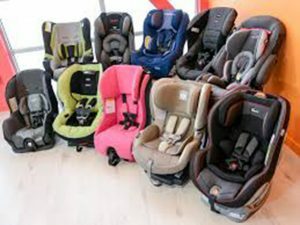 With so many choices on the market it is hard to discover which car seat you can get the most use out of before having to buy a new one to meet the growing needs of your child. With most state regulations require that you purchase new car seats for different stages of your child’s life. In the first year, or until your baby weighs over 30lbs, it is mandatory for you to use a rear facing car seat, after that, your child’s legs will most likely need more room and you will have to purchase a car seat that faces forward. To avoid having to buy two car seats within a year of your child’s birth, car seat manufacturers have come up with a convertible car seat design to meet the regulations for both infants and toddlers that weigh between 4lbs and 65lbs. By far the biggest advantage of a convertible car seat is that it is one of the safest car seats available. This one seat meets the safety regulations for a rear and forward facing child’s car seat. Convertible car seats can be installed to face the rear of the vehicle, and when the time comes to turn the seat around, it can be uninstalled and reinstalled to face the front of the vehicle. Convertible car seats also come equipped with the 5 point safety harness and a removable, padded, head stabilizer to keep an infant’s head from being forced forward or side to side. Another advantage is that instead of buying two car seats, you will only need to buy one for the first couple of years of your baby’s life. Car seats can cost from $100-$300 for the most basic safety seat. One of the disadvantages of the convertible car seat is that it does not have a car seat base. This means that you cannot remove the child from the car by detaching the seat from a base because it is built in. Thus, you have to remove the child from the seat when you are taking them out of the vehicle. With that being said, you also cannot use it as a carrier for an infant. In fact, it doesn’t come with a handle; it is simply not portable outside of the vehicle. It also means that it is not easy to switch vehicles. Installation can be difficult and time consuming to get the seat installed properly. With an infant car seat it is much easier to purchase detachable bases that can be left installed in the vehicles making it easy to use the same car seat with multiple bases. The convertible car seat is one of the most popular car seats on the market. Consumers like that they spend less money and that the seat can be used for such a long period of time. In fact the idea of having a convertible car seat has also become popular with car seats for dogs! You might think that a dog owner is treating their pet too much like a child, but using a dog car seat can not only save the dog, but also prevent it from flying into and injuring a passenger or a child on impact.